Understanding strategies to de-power the sails when the wind comes up are as important sail maneuvers as tacking and jibing. Reducing sail is not only a safety measure for boat and crew, but it also improves boat handling, performance and speed. As the wind increases, many forces act upon the boat. The effect can seem dramatic because the force on the sail is proportional to the square of the wind’s velocity. So an increase in wind speed from 10 knots to 20 knots is a four-fold increase in force on the sails (10x10=100 vs. 20x20=400). The effect on the boat is noticeable: angle of heel increases, often accompanied by a tendency for the boat to head up or develop weather helm. Reefing not only adds to safety for the boat and crew, but the maneuver can also increase speed and performance. The extra wind exposes more of the hull and creates drag on the rudder. Reefing flattens the boat, increasing speed and ease of handling — plus you get a smoother ride. ​Several strategies de-power the sails include: moving traveller to leeward; easing the main; easing the jib sheet and moving the jib sheet fairlead car aft; heading up or pinching in a gust. But the most reliable way to gain control is to reef. And it’s always easier done sooner, when you first think of it, rather than later when there’s more drama. You can always shake out the reef if you don’t need it. All reefing on Celtic Song is accomplished from the cockpit. Here she carries a double reef. Helm outlines roles and assigns crew. 2 One crew member stationed by port clutch; a second by starboard clutch. Close 1st tack and clew clutches. 3 With main luffing, helm signals starboard crew to ease main halyard until the first row of cringles set into the main reaches the boom. 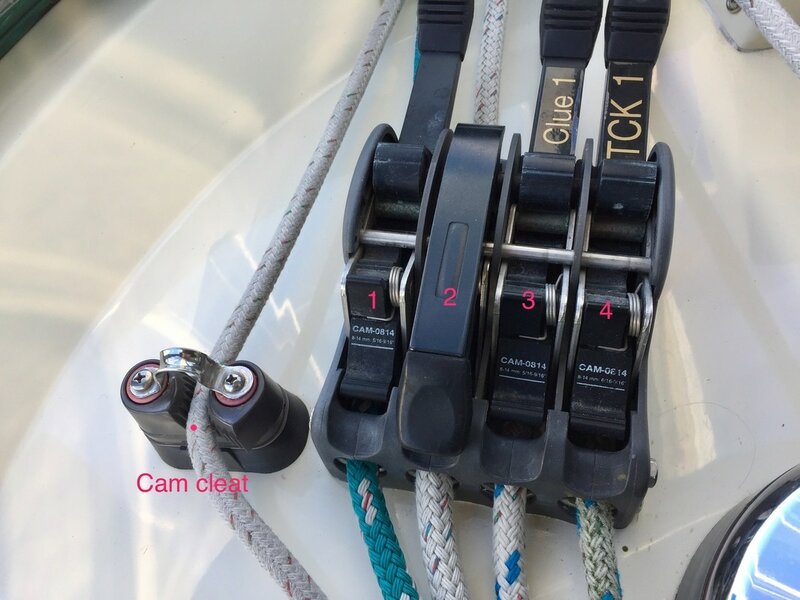 4 Crew at port clutch starts hauling both tack and clew reef lines as halyard is eased. 5 Crew at starboard clutch also hauls in 2nd reef tack and clew to take in slack. 6 Goal for port crew is to snug both tack and clew to boom. 7 When 1st reef tack and clew are secure and tight against the boom, the helm gives order for starboard crew to raise the main. 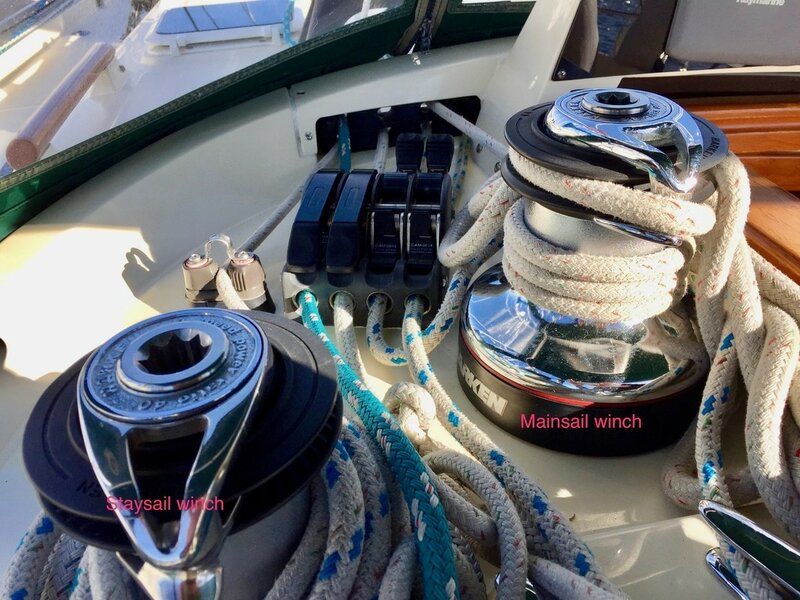 8 Crew releases the mainsheet and raises the main using winch until the luff is taut. 2nd reef tack and clew clutches remain open. 9 Helm falls off, resumes sailing and shuts off engine. The procedure is essentially the same as tying in the first reef. The 1st reef remains secured. 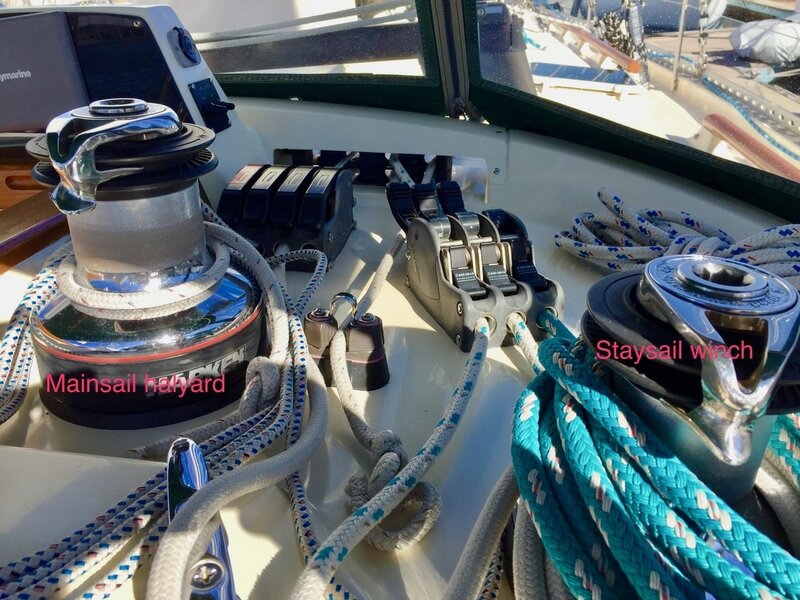 2 Starboard crew closes tack and clew clutches and eases main halyard to second set of cringles while hauling in tack and clew reefing lines. Second crew can help here. 3 Ease the mainsheet; snug 2nd reef tack and clew against the boom and raise the main. 4 Crew adjusts the main sheet while helm resumes course and shuts off engine. 2 Crew open tack and clew reef clutches. 4 Helm resumes course and shuts off engine. Celtic Song can be easily reefed while under sail or heaved to. The bat cars on her mainsail track allow the sail to move freely when off the wind on a beam reach to a close haul. The halyard for the staysail is located on the starboard side of the mast. The staysail is a small, rugged sail that attaches to a foredeck halyard located between the mast and the forestay. Celtic Song has a nifty removable stay that lives starboard of the mast when not is use. It has a turnbuckle-like gear that fastens it to the foredeck and tensions the stay. The staysail can be used to increase sail when flying both the main and jib. It can also nicely balance a reefed main in heavy winds when flying the jib would overpower the boat. 1 Set up and tension the stay on the foredeck. 2 Attach the tack to nearby eye. 3 Hank on the staysail. 4 Uncoil the green staysail lines in the cockpit. 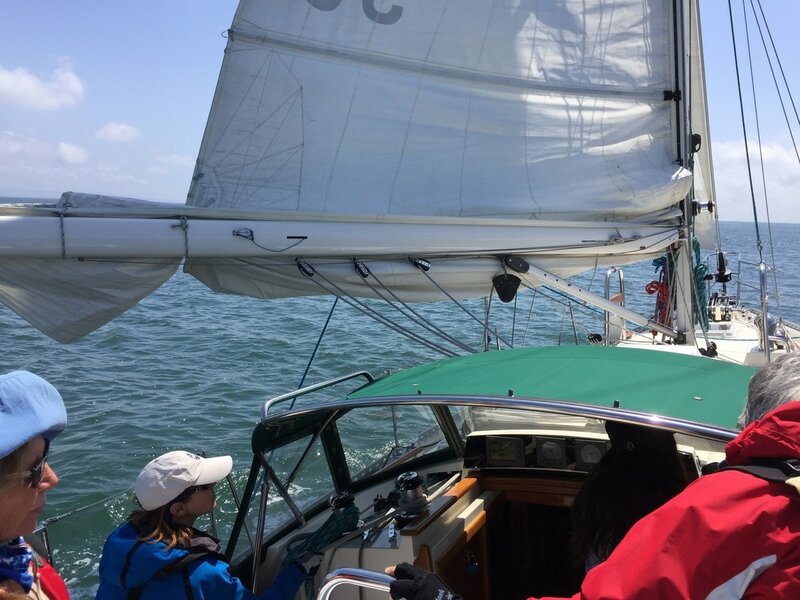 5 Find the ends on deck in the staysail fairleads. 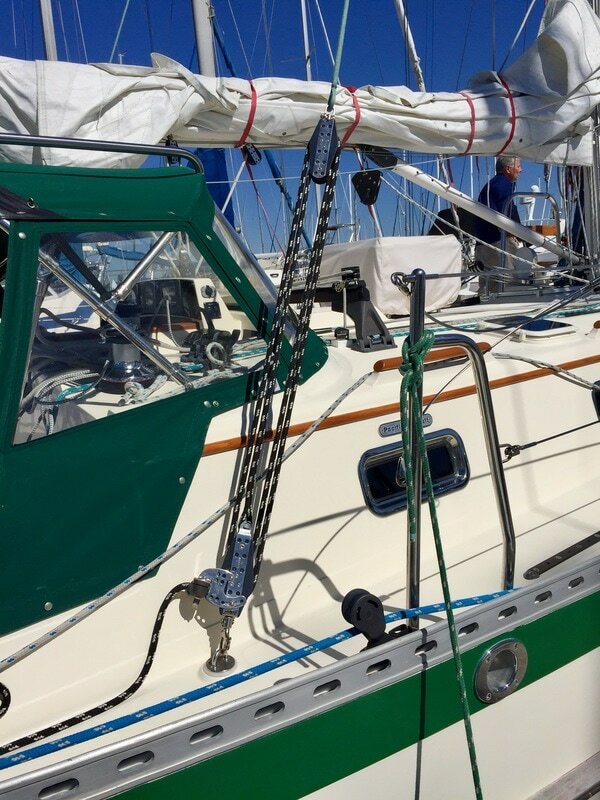 Untie the stopper knots and run the leads between the two inner port and starboard shrouds. Attach port and starboard clew lines to sail cringle using a bowline. 6 Find the black running backstay lines bundled near mast on the port and starboard sides. 7 Untie the lines, run them to about a third of the way from the stern and clip them into the eyes located there. Tighten using the cam cleats. 8 Attach the halyard located on the starboard side of the mast. 9 The sail is raised from the mast, using the winch located there. 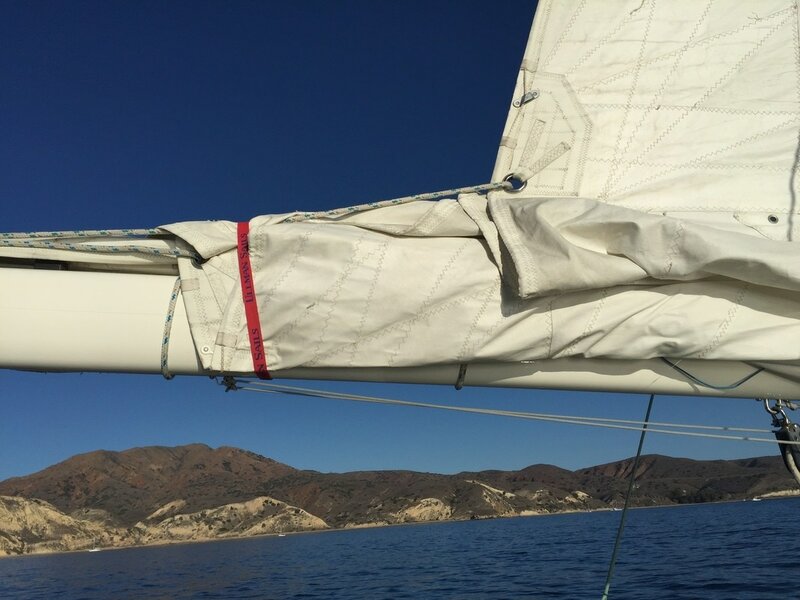 10 Remember to ease the running backstay on the leeward side so the mainsail doesn’t chafe against it. 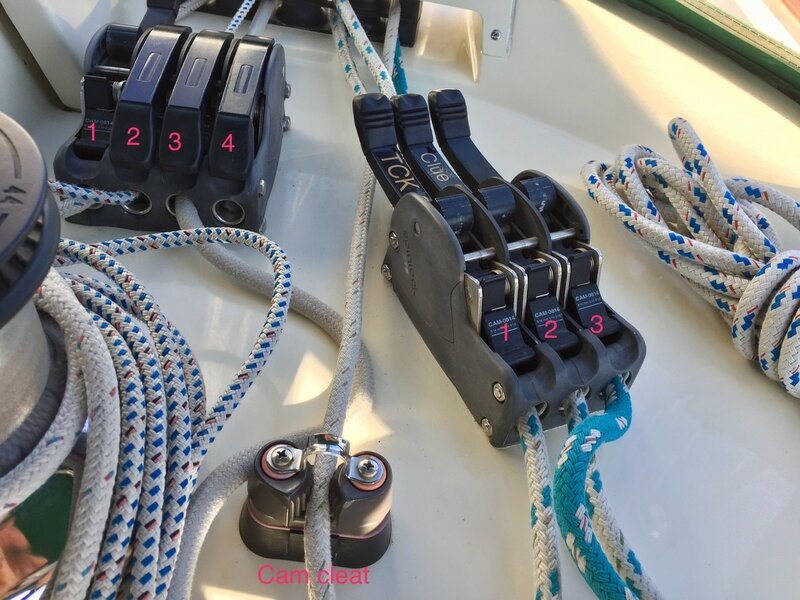 11 Check the clew leads when on a broad reach or run. They may need to be repositioned so they don’t rub against the shrouds. 12 Reverse the procedure to douse the sail. 13 In port, once the lines are off, leave the sail attached to the stay, pull the sail along the leach, flake it and fold from back forward. 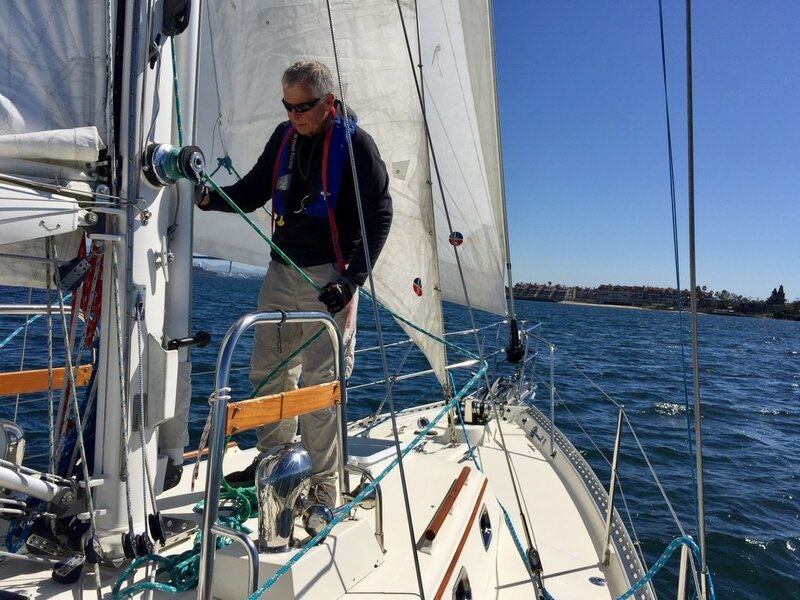 Running backstays support the mast while flying the staysail.